Russia’s representative Sergey Lazarev scored an overall victory this year. His entry You Are The Only One, written and composed by Philipp Kirkorov, Dimitris Kontopoulos, John Ballard and Ralph Charlie, won the Best Song category with 11.69% of the vote, and Sergey came out on top in the Best Male Artist voting with 21.61%. Congratulations to Sergey and to the writers of the song! It’s the third time for Russia to win in the ESC Radio Awards, in 2008 Dima Bilan won Best Song and Best Male Artist, and in 2015, Polina Gagarina won the Best Female Artist award. The second place in Best Song goes to the French entry J’ai Cherché (11.39%) performed by Amir who also gained second place in the Best Male Artist category (20.80%), again close behind Sergey Lazarev. 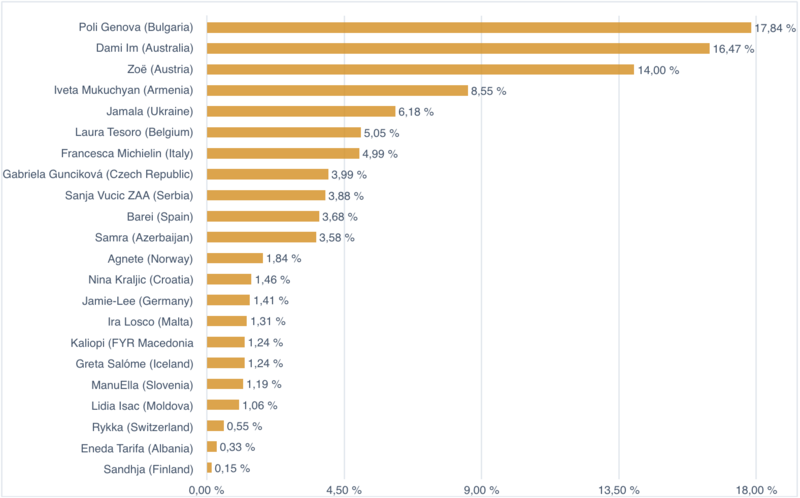 The Bulgarian entry If Love Was A Crime finished in third place with 9.04% of the vote. This year’s Eurovision Song Contest winning song 1944 performed by Jamala for Ukraine came sixth. In the Best Female Artist category, Bulgaria’s representative Poli Genova finished on top with 17.84%. 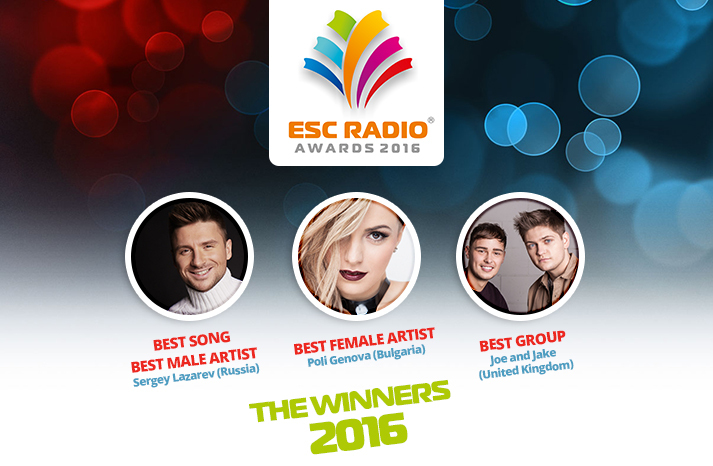 It’s Bulgaria‘s first-ever win in the ESC Radio Awards since 2006 when the annual poll was started. 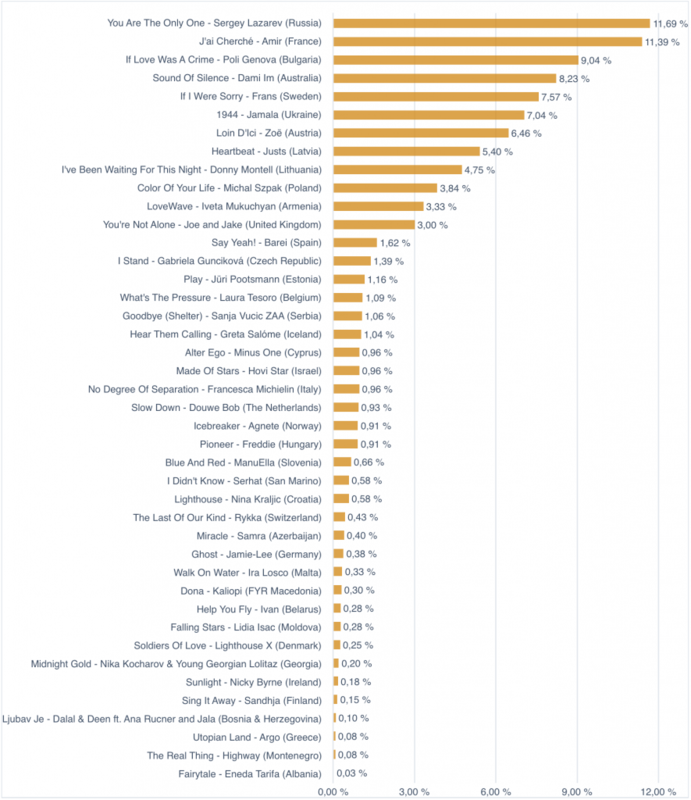 Runner-up in Best Female Artist is Dami Im from Australia (16.47%), followed by Zoë from Austria with (14.00%). Ukraine’s Eurovision Song Contest winner Jamala came fifth. As mentioned above, the Best Male Artist voting was dominated by Sergey Lazarev from Russia (21.61%) and Amir from France (20.80%). The second place in Best Song and Best Male Artist is the best-ever result for France in the ESC Radio Awards since 2006 when the annual poll was started. Before Amir, the country’s best result was a third place in the 2009 Best Song voting with Et S’il Fallait Le Faire, and a second place for Patricia Kaas in the Best Female Artist category that same year. The third place in Best Male Artist this year goes to Justs from Latvia (Heartbeat). He scored 13.59% of the vote. The Best Group voting saw a neck-and neck race between Joe and Jake from the United Kingdom and Minus One from Cyprus. Close to the finish, the guys from the UK pulled ahead (28.49%), beating Minus One to second place (26.77%). Denmark’s trio Lighthouse X ended in third place with 19.16% of the vote. Congratulations to all the winners! We will get in touch with them to hand over the trophies as soon as possible. 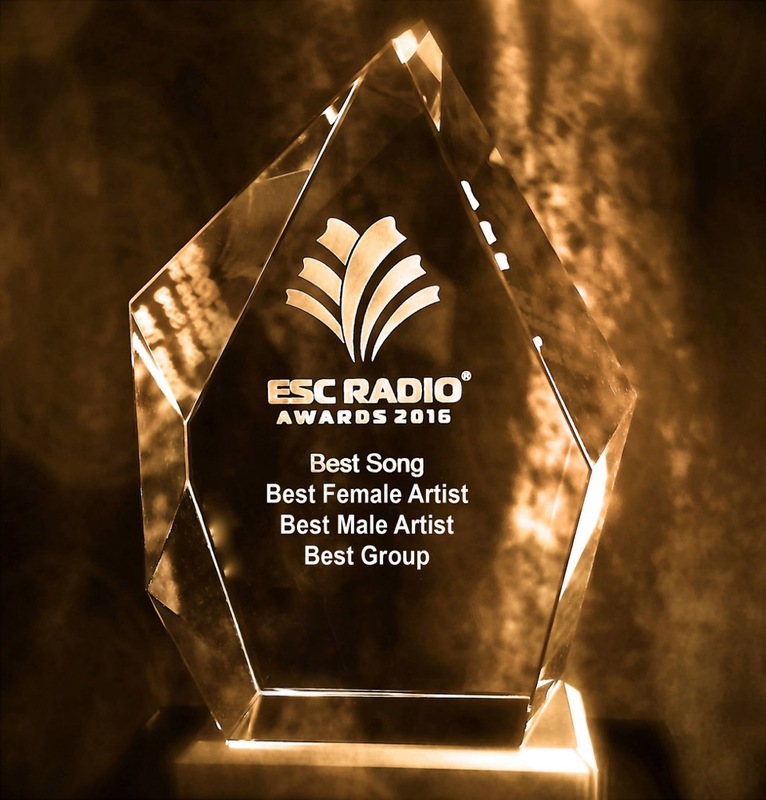 For the complete rankings of the 2016 ESC Radio Awards, see below please. This entry was posted on Monday, July 4th, 2016 at 4:59 pm	and is filed under ESC Radio Awards, News. You can follow any responses to this entry through the RSS 2.0 feed. You can leave a response, or trackback from your own site. Sergey Lazarev I love You!